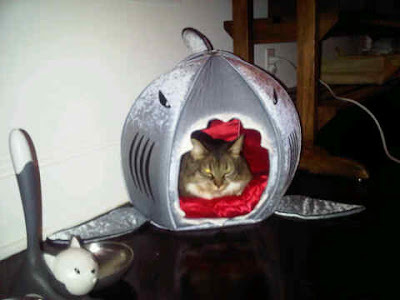 Catsparella: Celebrity Cat Shopping: Where Can I Get Kitty Purry's Cool Shark Bed? Celebrity Cat Shopping: Where Can I Get Kitty Purry's Cool Shark Bed? It's not every day that a celebrity cat goes viral, but that's exactly what happened yesterday when Katy Perry's furry daughter, Kitty Purry, became a trending topic on Twitter. It all happened shortly after the songstress posted the above picture of Kitty on her feed, with the caption, "Cutest picture of the day: Kitty Purry in her shark bed being a boss!" Though we're used to socialites and other celebs flaunting their famous canines, it's more unusual to get a glimpse of a celebrity kitty and their high-class gear. Want to know where you can get the goods to make your cat feel like a famous feline? Read on for more! 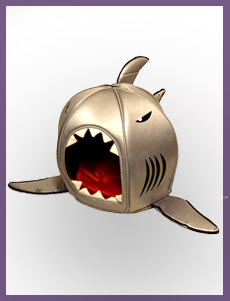 Nobody tell Kitty, but this $69.00 Nano Shark pet house by Prima Dog is actually marketed towards pooches! Described as "a perfect headquarters for your pup's adventurous undersea dreamscape," the hideaway is manufactured using "Nanotechnology from Japan which maintains cleanliness and freshness all night long." The foldable lair also comes in a variety of other cool styles, like Strawberry, Cat, Clownfish, and more! 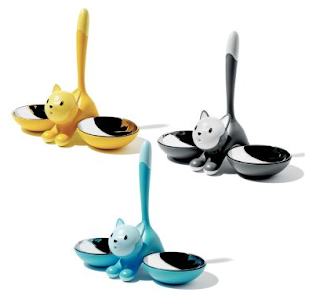 Also spotted in the snap is the Alessi "Tigrito" Cat Bowl, designed by Miriam Mirri. The stylish bowl comes in three distinctive colors, and with a $90.00 price tag, it's the purrfect way to make your pampered pussycat feel like a star! the shark bed is too funny! I think it is much better for kitties than for a woofie!